« What is the simple management strategy for reversing diastolic dysfunction? 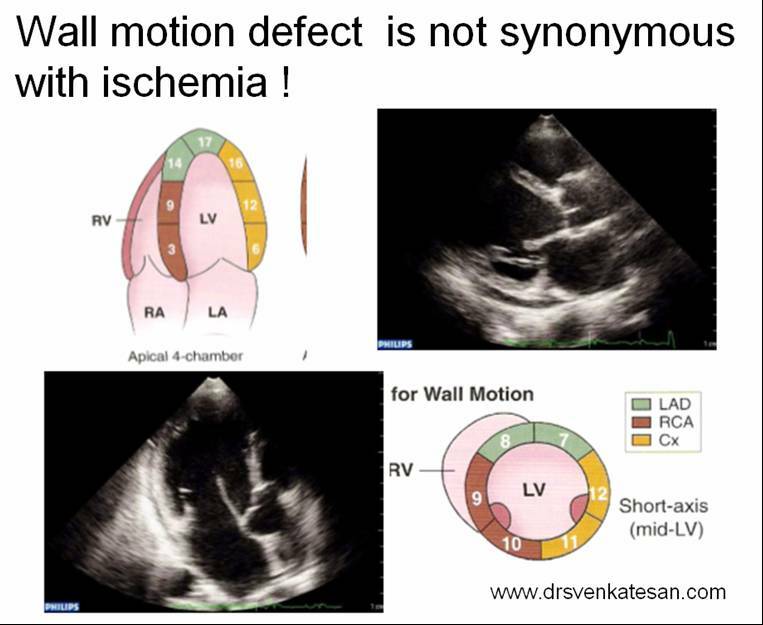 How common is myocardial wall motion defects in the absence of ischemia or infarction ? Myocardial wall motion defects are sine qua non of coronary artery disease. This occurs as regional wall motion defects following myocardial infarction or during unstable angina.Myocardium is divided into 16 segments for this purpose. The wall motion defect occurs in the respective segments , depending upon the compromised coronary arterial blood supply. Under physiological conditions myocardial segments contract in a synchronous fashion so that the chambers have a uniform contraction and relaxation. The heart is a complex electromechanical organ. Any thing , that interferes the sequence of electrical conduction or mechanical contraction or relaxation can result in WMD. Apart from this , differential filling of right and left ventricle can make one ventricle bigger or smaller in relation to other ventricle .This makes the ventricle to contract or relax earlier or later (ASD ).This can not produce WMD in the strict sense , but since the IVS is shared between the two ventricles there can be paradoxical septal motion which mimics WMD. The other major cause for WMD in the absence of CAD is pericardial pathology .we know pericardium limits ventricular dilatation. When there is a defect in pericardium , after pericardiectomy ( cardiac surgery patients) part of the myocardium can bulge out (or tend to bulge ) .This happens often , anteriorly to produce a WMD. Similarly a pericardial pathology which constricts can cause a regional compression .This can happen in many of the adhesive pericarditis .They may resolve or end up with progressive constriction.These type of WMD is especially common in the posterior surface of the heart just near the AV groove. The much glamorous entity WPW syndromes and it’s variant can result in WMD due to pure electrical short circuiting hence altering the sequence of ventricular contraction .In fact one can try to locate the accessory pathway origin and insertion sites depending upon the WMD .The segments abutting the insertion site , that are innervated by accessory pathway fibres contracts prematurely and out of phase. Rarely primary muscle disease like cardio myopathy can have regional WMD .This is uncommon as global hypokinesia is the hall mark . Regional variation in fibrotic processes can result in WMD. CRT : Cardiac resynchronisation therapy is supposed to normalise the pathological WMD sas in ischemic or non ischemic cardiomyopathies. Ironically CRT may induce new wall motion defects if lead position and stimulation protocols are not proper. Abnormal heart position can result in WMD. Ascites , High pressure pleural effusion /Pneumothorax can cause WMD of heart . Pregnant women may show physiological WMD due to relative shift of abdomen. Contrary to the popular perception , wall motion defects(WMD) are not an exclusive property of CAD.It can occur in varied pathological states both mechanical and electrical .The implication for not recognizing this fact can be enormous .The “fancy habit” of diagnosing acute coronary syndrome solely by means of echocardiographic WMD (With out ECG / Enzyme changes ) is to be strongly discouraged .